Ascendant is an Enemy in Mass Effect Andromeda. 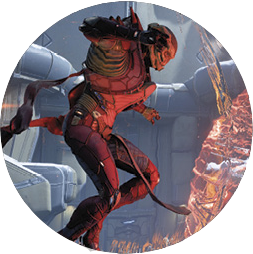 "The kett’s elite battle master who can elevate above the fray to gain a tactical advantage. An Ascendant charges a variety of devastating attacks that we are quantifying and attempting to understand." Health & Resilience: Incredibly high normal health, further protected by an invulnerable electromagnetic force field while it’s empowered with its active orb. When unprotected, the Ascendant is vulnerable to disabling biotic effects. However, it can instantly recover to resummon its protective orb after a certain period of time. The orb is vulnerable to burning, freezing, and electrical damage, allowing for power combos.